Hostal Patria in Madrid is a friendly place to stay in downtown Madrid, It is outstanding not only because of its extraordinary location and customer service but also because of the quality of the rooms, which are clean, comfortable and well-equipped. 90, 120 or 150 cm. wide single beds, subject to availability. Private or shared bathroom. Air-conditioning or fan. Noise-resistant doors and windows. Our double rooms range in size from 11-15 square metres and have either one double bed (135 cm. wide) or two single beds (90 cm. wide and 135 cm. wide). They are designed for double occupancy and have a full bath and air conditioning. Some rooms have a balcony. Windows and doors are noise-resistant. Our triple rooms range in size from 14.50 square metres to 21.50 square metres. They have either three beds (two 90 cm. wide and the other 135 cm. wide) or one double bed (135 cm. 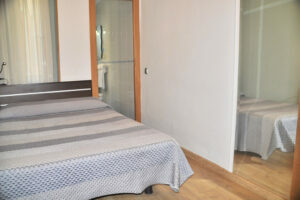 wide) and one single bed (90 cm. wide). These rooms are designed for triple occupancy. Rooms with three beds can also sleep four, if two people occupy the double bed. All rooms have full bath and air conditioning, as well as noise-resistant windows and doors. Some rooms have a balcony.